*Trailer package included in rental. Bucket sizes available: 8", 12", 16". (1) included with rental. 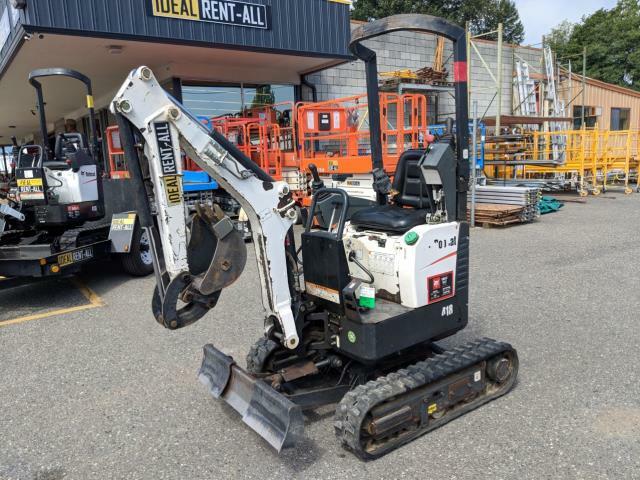 If you need to rent the smallest Mini Excavator around for a commercial or residential project that involves close-quarters work, the ultra compact Bobcat 418 Mini Excavator might be the perfect choice. It's maximum digging depth of 6 feet and a reach of 10.2 feet makes it a versatile tool. The Bobcat 418 is the smallest rubber track excavator with a narrow width of just 27.8" and 110" in length, and has a height of 87". The Bobcat 418 features a hydraulically activated retractable undercarriage from 28" to 43". It's maximum dumping height is 6 feet. Power & Weight: The Bobcat 418's engine delivers 10.2 HP and has a rated lift capacity of up to 527 lbs. The Bobcat 418 mini excavator operating weight is 2,593 lbs. Compact & Versatile: The Bobcat 418's high drawbar pull (pulling force) delivers plenty of power for backfilling trenches or transporting materials. With an independent-swing boom and 360-degree rotation allows you to work in areas where shovels used to be the only option. With multiple attachment options, the Bobcat 418 is an extremely flexible tool. Call 811 before you start digging. It's easy and it's free. Whether you are planning to do it yourself or hire a professional, smart digging means calling 811 before each job to have underground utilities marked.